LS David Binn was signed to a 4-year extension in May. He was the only remaining member of the Chargers’ 1994 Super Bowl team. LB Derek Smith – Signed as a free agent. OL L. J. Shelton – Signed as a free agent. CB Drayton Florence – Left as a free agent. Signed with the Jacksonville Jaguars. RB Michael Turner – Left as a free agent. Signed with the Atlanta Falcons. In addition to their regular games with AFC West rivals, the Chargers played teams from the AFC East and NFC South as per the schedule rotation, and also played intraconference games against the Colts and the Steelers based on divisional positions from 2007. The Chargers began their 2008 campaign at home against the Carolina Panthers. After a scoreless first quarter, the Panthers pounced first as kicker John Kasay got a 44-yard field goal. The Chargers would take the lead with QB Philip Rivers completing a 44-yard TD pass to WR Chris Chambers, yet Carolina would take the halftime lead as Kasay nailed a 33-yard and a 30-yard field goal. In the third quarter, San Diego got the lead with kicker Nate Kaeding getting a 27-yard field goal, yet the Panthers regained the lead with CB Chris Gamble returning a fumble 31 yards for a touchdown. In the fourth quarter, Carolina increased its lead with Kasay nailing a 49-yard field goal. Afterwards, the Chargers got the lead again with Rivers completing a 24-yard TD pass to TE Antonio Gates and a 5-yard TD pass to WR Vincent Jackson. Unfortunately for San Diego, Panthers QB Jake Delhomme threw the game-winning 14-yard TD pass to TE Dante Rosario as time expired. In the third quarter, the 'Bolts began to rally as Rivers completed a 15-yard TD pass to Chambers, along with Kaeding nailing a 21-yard field goal. In the fourth quarter, San Diego took the lead with Kaeding's 28-yard field goal and Rivers’ 66-yard TD pass to Sproles. However, Denver responded with a 12-play, 80-yard drive (which included a second controversial officiating call that turned a game-winning fumble into an incomplete pass) that concluded with Cutler completing a 4-yard TD pass to WR Eddie Royal, including Cutler's 2-point conversion pass to Royal. Hoping to avoid an 0–3 start, the Chargers went home for a Week 3 MNF duel with the New York Jets. In the first quarter, San Diego trailed early as Jets CB David Barrett returned an interception 25 yards for a touchdown on QB Philip Rivers' first attempted pass of the game. The Chargers responded with kicker Nate Kaeding’s 36-yard field goal and a Rivers 1-yard TD pass to rookie FB Mike Tolbert. In the second quarter, the 'Bolts increased their lead as CB Antonio Cromartie returned an interception 52 yards for a touchdown. New York tried to answer as QB Brett Favre completed a 3-yard TD pass to WR Laveranues Coles, yet the Chargers replied with Rivers completing a 27-yard TD pass to WR Chris Chambers and a 6-yard TD pass to TE Antonio Gates. Coming off their MNF home win over the Jets, the Chargers flew to Oakland–Alameda County Coliseum for a Week 4 AFC West duel with the Oakland Raiders. In the first quarter, the 'Bolts trailed early as Raiders kicker Sebastian Janikowski got a 22-yard field goal, along with Safety Gibril Wilson sacking QB Philip Rivers in his endzone for a safety. In the second quarter, San Diego continued to trail as QB JaMarcus Russell completed a 63-yard TD pass to TE Zach Miller, along with Janikowski's 28-yard field goal. In the third quarter, New Orleans increased its lead Brees completing a 1-yard TD pass to TE Mark Campbell, after a very controversial Pass interference call on cornerback Cletis Gordon put the Saints on the 1-yard line. The 'Bolts would answer with Kaeding getting a 24-yard field goal. In the fourth quarter, the Saints continued to build its lead as FB Mike Karney got a 1-yard TD run. San Diego tried to rally as Kaeding nailed a 31-yard field goal, Rivers completed a 14-yard TD pass to WR Vincent Jackson, and Brees giving the 'Bolts a safety via an incomplete pass thrown into the back of his own endzone. However, New Orleans’ defense stiffened for the win. In the third quarter, the Chargers tied the game as QB Philip Rivers completed a 5-yard TD pass to WR Malcom Floyd. In the fourth quarter, San Diego took the lead as Rivers completed an 8-yard TD pass to TE Antonio Gates. The Chiefs tried to rally as Thigpen completed a 3-yard TD pass to Gonzalez after a very controversial Pass Interference call on Safety Clinton Hart, in which Gonzalez did not look for a flag, making the call even more controversial. Fortunately, the Chargers’ defense stopped both the 2-point conversion and the ensuing onside kick to preserve their much-needed victory. In the third quarter, San Diego began to charge back as safety Eric Weddle returned a fumble 86 yards for a touchdown (with a failed two-point conversion). In the fourth quarter, Atlanta began to pull away as Ryan completed a 5-yard TD pass to WR Harry Douglas. The Chargers tried to come back as kicker Nate Kaeding nailed a 28-yard field goal. However, the Falcons’ defense prevented any possible comeback. Hoping to get a 2nd straight win and stay alive for the playoffs, the Chargers went to Kansas City for a divisional road game vs. the Chiefs. The 'Bolts trailed early as RB Larry Johnson threw a 4-yard TD pass to TE Tony Gonzalez. The Chiefs extended the lead to 14–0 when QB Tyler Thigpen completed a 1-yard TD pass to WR Dwayne Bowe. The 'Bolts closed out the half with Nate Kaeding getting a 32-yard field goal. The Chiefs started the 2nd half by Thigpen scrambling for a 3-yard TD. The Chargers started to rally as RB LaDainian Tomlinson getting a 6-yard TD run, while QB Philip Rivers completed a 4-yard TD to Malcom Floyd (with a failed 2-pt conversion) with 1:19 left in the game. The 'Bolts recovered the onside kick and Rivers threw a 10-yard TD to WR Vincent Jackson with 40 seconds left (with another failed 2-pt try). to take a 22–21 lead. The Chiefs’ only answer was kicker Connor Barth's 50-yard field goal try sailing wide left as time expried. In the first quarter, San Diego struck first as kicker Nate Kaeding got a 28-yard field goal. 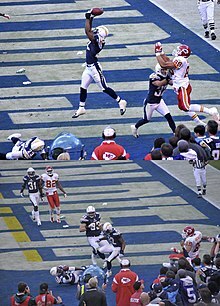 The Broncos would respond with running back Tatum Bell getting a 26-yard touchdown run (with a failed PAT), yet the Chargers answered with running back LaDainian Tomlinson’s 1-yard touchdown run. In the second quarter, San Diego would jump out to a big lead as quarterback Philip Rivers completed a 12-yard touchdown pass to tight end Brandon Manumaleuna, followed by Tomlinson’s 4-yard touchdown run. Denver would try to rally in the third quarter as Bell got a 37-yard touchdown run, yet the Chargers struck back with Rivers completing a 13-yard touchdown pass to running back Darren Sproles, followed by a 14-yard touchdown run by Tomlinson. The Broncos would try to make a comeback in the fourth quarter as quarterback Jay Cutler completed a 25-yard touchdown pass to tight end Tony Scheffler (followed by Cutler’s 2-point conversion run), yet San Diego pulled away with Sproles’ 2-yard touchdown run and ending with rookie fullback Jacob Hester’s 4-yard touchdown run. San Diego got off to a fast start in the first quarter as quarterback Philip Rivers completed a 41-yard touchdown pass to wide receiver Vincent Jackson. The Steelers responded with wide receiver Santonio Holmes returning a punt 67 yards for a touchdown. The Chargers answered in the second quarter as kicker Nate Kaeding got a 42-yard field goal, but Pittsburgh struck back with running back Willie Parker’s 3-yard touchdown run. The Steelers would add to their lead in the third quarter as quarterback Ben Roethlisberger completed an 8-yard touchdown pass to tight end Heath Miller. The San Diego Chargers ran exactly one offensive play in the third quarter, which resulted in a Philip Rivers interception off a deflection. In the fourth quarter, San Diego tried to rally as Rivers completed a 4-yard touchdown pass to wide receiver Legedu Naanee, but Pittsburgh answered with Parker’s 16-yard touchdown run. The Chargers tried to come back as Rivers completed a 62-yard touchdown pass to running back Darren Sproles, but San Diego’s onside kick attempt failed, allowing the Steelers to seal the win. With the loss, the Chargers’ season ended with an overall record of 9–9. ^ Maske, Mark (October 25, 2006). "Owners Give Approval For NFL Games Overseas". Washington Post. Retrieved January 17, 2008. ^ "Chargers, Broncos will play for AFC West crown on Sunday night". Archived from the original on December 20, 2008. Retrieved December 22, 2008.